Do you want to learn more on Taurus and Virgo compatibility? Then you have just come to the right place. Check it out. A couple formed by Taurus and Virgo has high compatibility and they should maintain a solid relationship. But before checking the compatibility, learn a bit more about each of these signs. The couple of Taurus and Virgo will form a solid relationship full of stability. Taurus has Venus as its regent, which helps him to be smoother and affectionate with the people that surround him. Virgo is ruled by Mercury who gives it unmatched mental agility. Both signs are from the element Earth. This means that they may find great comfort in each other, as they understand where each one is coming from. They know how to relate to the other, what turns the other on – and off. A couple formed by two Earth signs can actually be a very calming and soothing combination that could even promote inner peace. Of course not everything is perfect and if one or even both of them are pessimistic, then problems might come up, and they can even drag each other down. 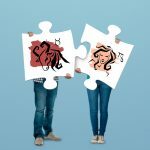 Taurus and Virgo compatibility: how will the relationship work? Taurus has a mild temperament when faced with everyday situations. But when he decides to impose his ideas he becomes very stubborn. Virgo is very treatable and has a natural charm that gives it great. The moment a person born under the sign of Virgo has an idea and decides to execute it, it might even become obsessive and he will struggle until it is achieved. These are some less positive aspects that both signs need to focus on and work on, so they can succeed. This couple of Taurus and Virgo is destined to maintain an excellent relationship. However, they should try to have tolerance when they are facing strong situations that might occur along times. Taurus is a very patient sign but when it reaches great extremes of anger its onslaught is brutal. Virgo is quite demanding and extremely perfectionist and it needs to have a partner that resists its constant criticism and demands. They need to pay full and mutual attention if they really want to achieve good level of communication. Virgo needs to know the details when establishing a communication with his partner. Taurus communicates realistically expressing each event with accuracy. The couple Taurus and Virgo can live very comforting and very happy intimate moments. Virgo will fill the partner with unforgettable details and Taurus will wrap Virgo with his sensuality full of great affection.